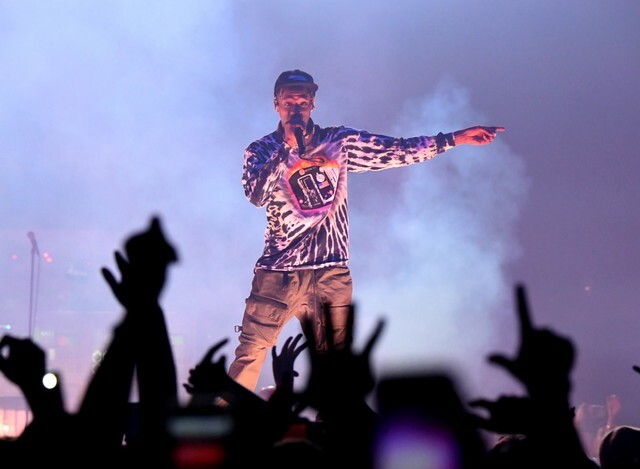 Travis Scott performed at Atlanta’s State Farm Arena Friday night as part of his Astroworld: Wish You Were Here tour and during his set, the rapper brought out 2 Chainz to perform “Whip,” their new collaboration from 2 Chainz’s latest album Rap or Go to the League. Elsewhere in the night, Scott brought out Future to perform the seasonally appropriate “March Madness.” Young Thug and Rick Ross also came out for the Atlanta show, as Billboard points out. Scott’s latest album Astroworld was released last August, with its hit “Sicko Mode” later appearing on our list of the 101 Best Songs of 2018. The album was later nominated for three Grammy Awards including Best Rap Album, Best Rap Song (for “Sicko Mode”), and Best Rap Performance (also for “Sicko Mode”). He performed the songs “Mile High” and “No Bystanders” at the ceremony. Watch clips of his recent Atlanta performance below.